Articles allows you to access and read Wikipedia on your iPhone or iPod touch. (Developer Sophiestication Software also offers a separate version of Articles for the iPad.) The $3 iPhone app offers access to a wealth of information but with one small caveat—it takes a while to get to that info. 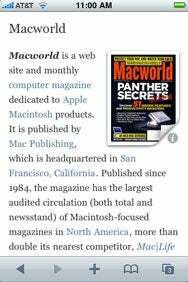 Wikipedia to Go: The iPhone and iPod touch version of Articles offers you mobile access to Wikipedia entries; you can even bookmark entries for later reading. Think of Articles as a pocket-sized version of Wikipedia. Wikipedia is familiar. In a way, Articles will seem familiar, too. The app uses the same navigational controls as the iPhone's Safari browser. Articles includes a search bar at the top of the screen, navigational arrows at the bottom and a "new tab" system which allows users to keep multiple pages open at a time. Once you find an interesting article, you can bookmark it and add it to a folder for later reading. You can also save photos directly to your iPhone with a tap of a button. Articles keeps copies of previously viewed entries in its history folder for easy offline viewing. It should be noted, however, that viewing new entries requires an active network connection. If you're looking for something new to read, Articles has you covered. The app includes a Surprise Me button, which displays a random Wikipedia entry, and a Nearby button which displays entries on places based on your iPhone's location awareness feature. The downside? Relatively slow load times. In testing Articles, I found load times for most entries ranged between six and 14 seconds. Article length and the presence of pictures didn't seem to alter load times significantly. Six to 14 seconds might not sound like much of a lag, but I found it very slow when compared to the free version of Wikipanion, which I've had on my iPhone for more than a year. Articles gives you mobile access to Wikipedia. It's handy and works well, but there are faster dedicated Wikipedia apps for your iPhone.